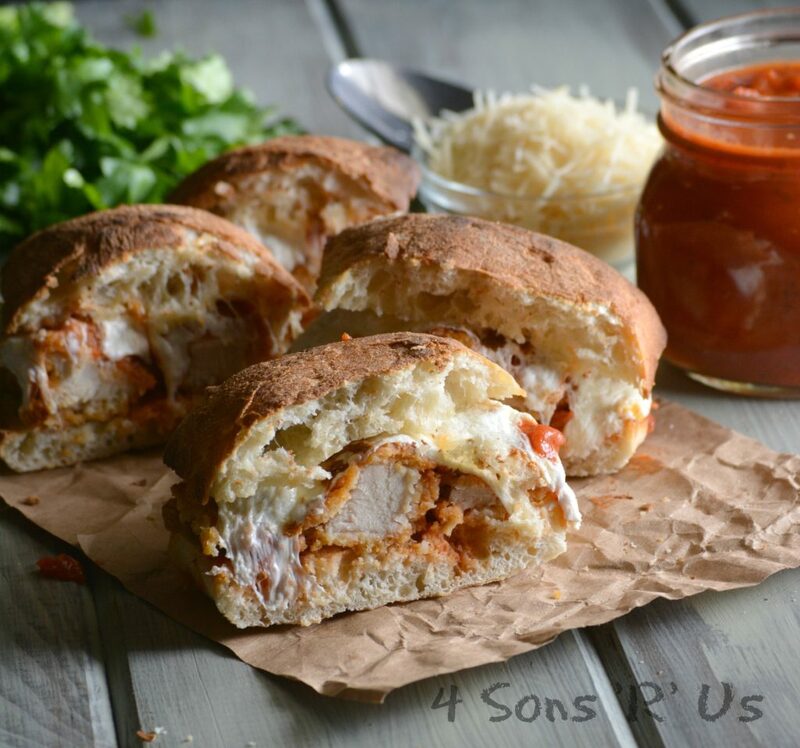 We’ve updated the Italian American classic, by sticking it in between a crusty Ciabatta bun that’s been spread with an irresistible sauce- with just enough left over for dipping. 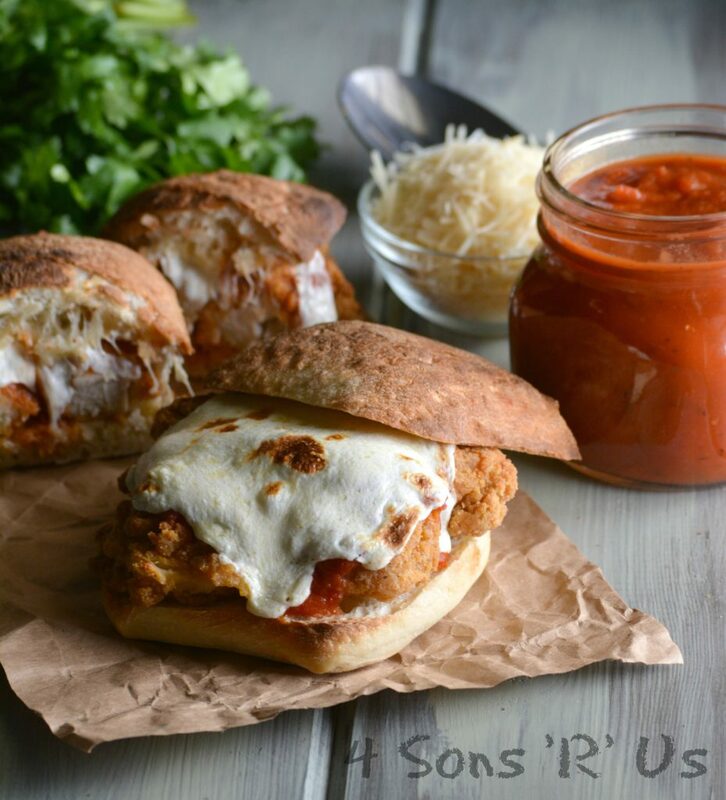 Cheesy Chicken Parmesan Sandwiches & Basil Garlic Aioli is a delicious dinner your family will love, that will even make your Nonna proud. Sandwiches. They used to be the bain of my existence. Seriously, as ridiculous as it sounds to me now, it used to be a major point of contention between the Hubs and I. He expected me to pack him a lunch, each and every single day. I did it one time to be nice, and it became an expectation from then on out. Most days, I didn’t mind- but I saw no reason for the big fuss if I forgot. Have you never made a sandwich before? I mean I would make stuff. Stuff you could pack and/or take. But, some days I’ve got a lot on my plate, he could pack it himself. The night’s I forgot to make him a sandwich? I must’ve wanted him to starve all day without food. It was too much to handle while he waited for his coffee to brew, etc etc. I got sick of it at one point. So did he. It probably was helped along by the cajoling of his friends, and also by the fact that he was tired of being hungry- but one day he just did it, and the next day, and the next- until he’d made it a habit. Since resolution of our kitchen Cold War, we’ve discovered some yummy compromises. And never fail to laugh at how hard headed we both were, and still are. The hubs packs his lunch every single day now. Occasionally he’ll ask me to make something specific for him for the week. Most weeks we have a lot of fun now on our weekend grocery trips planning out what we’ll eat for the week, and even prepping batches together on the weekends. He’s been on a soup kick recently, so last week we made a mega batch of his child hood favorite, his Nonna’s Italian Style Chicken Noodle Soup. This week he wanted sandwiches. I made him his favorite- ham & swiss on honey wheat (apparently I make the best simple sandwiches- the secret is a little mayo and freshly cracked black pepper). And to help me out, and say thank you for my efforts, he made one of my favorite sandwiches for everyone for dinner. Cheesy Chicken Parmesan Sandwiches & Basil Garlic Aioli. Crispy ciabatta buns are lightly spread with a bold basil garlic aioli, topped with freshly fried chicken cutlets spread with savory sauce and a creamy layer of stretchy melted mozzarella. 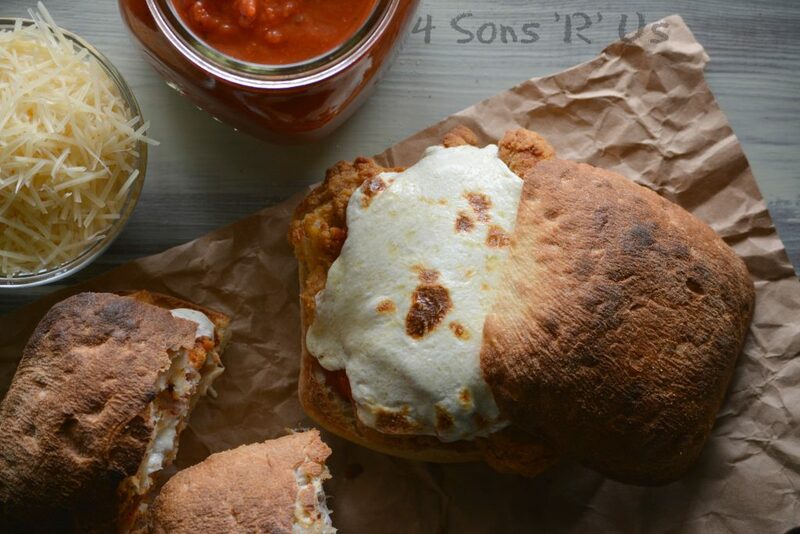 Cheesy Chicken Parmesan Sandwiches & Basil Garlic Aioli are the stuff millennial Italian-American dreams are made of. These hearty sandwiches are perfect for dinner, or a gourmet lunch. So tasty, you won’t want to talk, let alone argue, because it would take away from savoring every bite.They leave nothing but happy people, and the occasional peace treaty, in their wake. 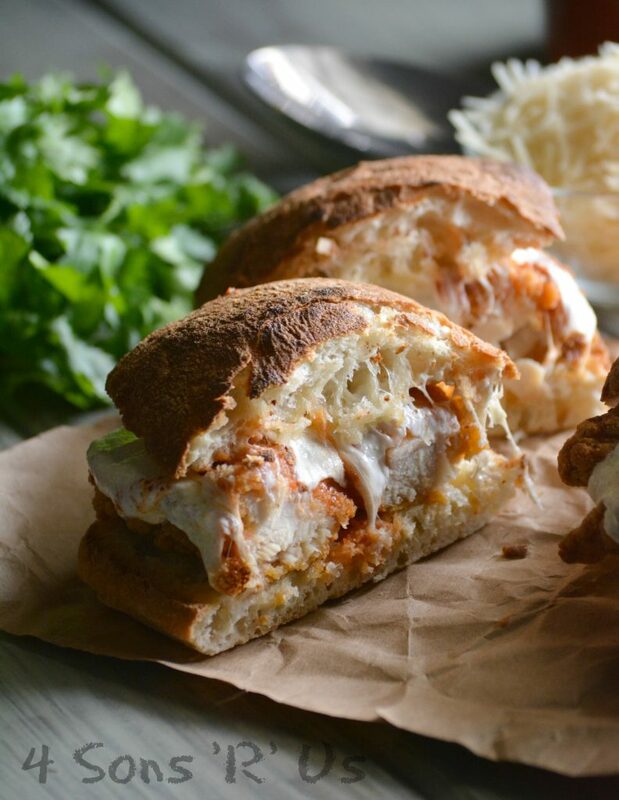 A classic Italian chicken dish is sandwiched between two crusty ciabatta buns with a creamy aioli and miles of melted mozzarella. Add all of the ingredients, except the oils to the bowl of a food processor fitted with the serrated blade attachment. Blend until chopped and combined. Combine the oils. Turn the food processor on, and while it's running slowly pour in the oils until it's emulsified, about a minute. Turn off, scrape the sides, and repeat until it's smooth and incorporated. Cover and chill in the refrigerator, until ready to use. Get out two plates, and one bowl. Add flour to one plate. To the other, add the bread crumbs, cheese, and oregano. Use a fork to stir them together until evenly combined. To the bowl, add the eggs. Add the oil to a large skillet, and heat over medium high heat. Liberally season the cutlets, or tenders, with salt & pepper. Dredge the chicken in the flour to coat lightly, shaking off any excess. Dip the chicken into the egg, and then immediately into the panko mixture, pressing gently, just enough to make sure the crust sticks. Transfer the chicken to the skillet, cooking 3-4 minutes- until golden brown, then continue cooking another 3-4 minutes, until the other side is also golden brown and it's cooked through. Remove all of the cooked chicken to a paper towel lined plate to drain off any excess grease. Spread the ciabatta buns out on a large sheet pan. Spread 1 tbsp of basil garlic aioli out onto the inside of each bun, the tops & bottoms. Onto each bottom bun, add 2 pieces of fried chicken. Spread 2 tbsp of sauce evenly out over top. Top each piece with a slice of mozzarella in the center. Place the sheet pan in the oven, under the broiler, and watching closely broil just until the cheese has melted slightly and begun to brown and bubble. Top the sandwiches, and serve immediately. Serve the sandwiches with chips of french fries, with the remaining basil garlic aioli for dipping. It’s definitely a filling meal all by its own self! Wow! I want all of these now!! They sound absolutely delish! Thanks for sharing at Fiesta Friday party!